Many educators are beginning to become aware of the growing teaching method referred to as “Flipping The Classroom”. Simply put… the teacher provides videos for homework, while traditional home work is done in class under teacher supervision. Unfortunately this might be just too simplistic of a definition. Possible this is why using the words “simply put” may not be the best practice in explaining anything. You see, at first this definition does make a lot of sense, and like so many “best practices” I see great value in the idea. In fact, how many parents have sat at the study table with their child only wishing that the teacher was available to explain a math problem? How many students have had to wait until the next day to ask that important question before finishing homework? Before hauling out the video camera and writing your lesson scripts or perhaps linking to the entire Khan Academy video selection… I have several points of reflection. Yes, I am a proponent of incorporating various multimedia and online learning in a blended environment. In fact… there is no doubt that this is the future of education. I say blended because I firmly believe that it is a real teacher that can really make a difference. Blended learning also incorporates some on-line instructional activities. Now, before jumping in the air and doing a full flip, educators must spend some time investigating and contemplating what might work best for their individual situation. Please spend a few moments and allow me to not only provide you with some resources… but also as you explore these resources, you may develop some points to ponder. It is my full intention to assist you in coming up with your own definition of the “Flipped Classroom”. As you go through the resources below… click on the links and immerse yourself. I have tried to find resources that really say it in a way that we can all understand. You may just begin to Flip your idea of Flipping! Blend My Learning (The Envision Experiment) - Oakland, California high school students who had failed algebra were randomly assigned to one of two summer school classes. The “control” classroom received a traditional five-week summer school curriculum for Algebra 1. The “treatment” classroom used Khan Academy for almost all of the period each day, and both classes had the same teacher. Take a look at their findings. The Economist: Teaching Methods – An Alternative Vote… Using Science To Teach Science - This study involves the theory of “deliberate practice” by psychologist Anders Ericsson. This research team introduced a more interactive, discussion-based and assessment-oriented approach to physics class that strongly implies major improvements to science and engineering instruction in general. Read what they learned. Learning About The Khan Academy - You have heard about Khan and have possible even used the tutorials. Before making your own… take a moment to learn from Khan and discover the method of his success. There really is a lot of thought in each of those clips. Jack McShea in his blog HG2S Training Blog gives an awesome explanation, provides a link to Khan’s TED Talk, and provides other useful Khan Links. The Flipped Classroom (Shedding Light on The Confusion, Critique, and Hype) - A wonderful article by Aaron Sams ,considered a co-creator of the flipped class model and the co-author of the book on the flipped class. In this article Aaron does a wonderful job of describing that one must be careful in defining the “Flipped Classroom”. He makes it clearly understood that Khan is just one type of Flip. A great article allowing educators to begin contemplating what their idea of a Flipped Classroom is. The Telegraph – Think Tank – Flip – Thinking – The New Buzz Word Sweeping The US - Well know writer Daniel Pink (A Whole New Mind and Drive) explains how education may be changing. Daniel tells the story of Karl Fisch (author of an awesome blog… Fischbowl) who is a 20-year veteran of Arapahoe High School located south of Denver, Colorado. He describes how Karl has found success with the Flip. New York Times – (Learning In The Dorm Because Class Is On The Web) - Is this the future? If this turns into a college norm… are K12 schools getting students ready? How might K12 incorporate Flipping (or blended learning) to help students transition to such an environment? Plan B: Flip The Classroom… Every Teacher Should Do This - I include this because the writer, Donald Clark, does an excellent job of pointing out both formative and summative assessment. Before using any Flip concept an educator should investigate their knowledge and practice involving both formative and summative assessment. How might “Flipping the Classroom” facilitate summative assessment through the incorporation of formative teaching and assessment strategies? USA Today: Flipped…Classrooms Take Advantage Of Technology - USA Today article that points out both advantages and some disadvantages to a Flipped Classroom model. This article provides essential ideas to ponder before making the Flip. The Flipped Classroom - A short but very enlightening article on positive applications involved in “Flipping a Class”. This article produced by the Center for Excellence in Teaching and Learning provides an important point to reflect on at the conclusion of the article. It states, “While I’m glad many educators seem to be jumping onboard with this model, my concerns are that some teachers may simply transfer their lectures to video and then have their students write papers or fill out worksheets during class. To me, that is bad pedagogy. However, if significant learning opportunities are capitalized on during class time, this could truly change learning and solve the problem, at least temporarily, of engaging students with material outside of the classroom” Wow… well said! Take a look at the video while you are there. Electronic Educator - Flip Your Classroom Through Reverse Instruction – Follow one teachers path toward Flipping (Reverse Instruction). Once again it is emphasized that class time must be carefully planned with innovative and engaging ideas. It is more than just helping students with what use to be homework! Also it points out that all stakeholders must be informed about the Flip. Make sure you see the videos. The Flipped Classroom Model - The Full Picture – And a full picture it is from a very informative and engaging blog entitled, “ UserGeneratedEducation”. After reading this article any educator will walk away with the idea that the Flipped Classroom is more than just videos followed by paper work. Jackie Gerstein does a wonderful job of bringing the whole idea of the process together. The graphics do a wonderful job of showing how asynchronous and synchronous connections work together to involve both the individual and the group. Plan on having a little time to spend… which will be well worth it. As you can see… the simple definition, “the teacher provides videos for homework while traditional home work is done in class under teacher supervision” does not quite fit the bill. In fact, this alone may turn a Flip into a Flop. Educators must first begin any Flip with a well thought out understanding and follow that with a plan of action. After developing you concept of a Flip classroom you may decide to take a little more time reading, researching and planning. Most importantly remember that students should always be at the center of instruction. 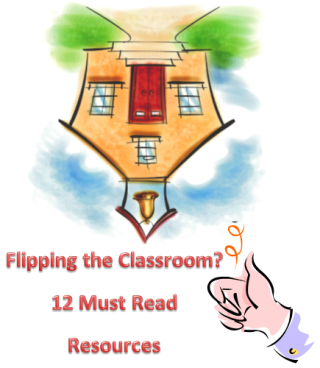 The idea of Flipping is another one of those wonderful peripherals we find in the true 21st century classroom.